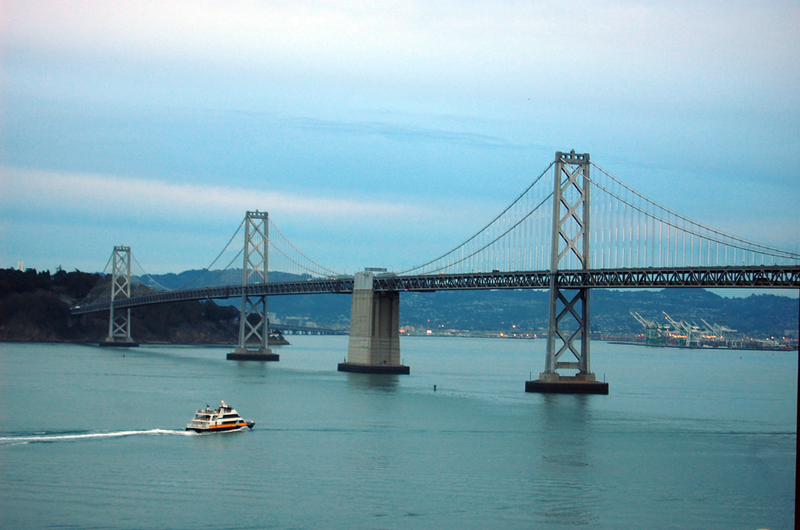 Node.js and Enterprise – Why Not? My daughter is 14. Like her father, she loves and plays music. 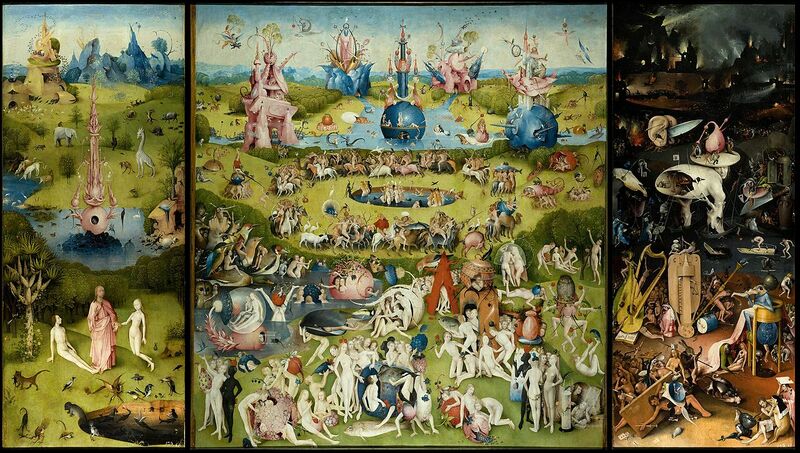 As with all the restless teens, sitting through multiple hours of Grammys 2014 was a non-starter. Therefore, she installed me as her push notification service. My role was to sit on the sofa (iPad in hand – I am not crazy to just watch TV for hours either), and alert her when the acts she was interested in arrived. Her alerts: Lorde, Lindsey Buckingham, Trent Reznor. In her room she created a ‘shrine’ on the drawer chest, consisting of the CD jewel cases of Mellon Collie and the Infinite Sadness by Smashing Pumpkins, The Greatest Hits by Fleetwood Mac, all Vampire Weekend CDs, Pure Heroine by Lorde and The Bell Jar by Sylvia Plath (the book, not the CD). Couple of years ago she exited the Beatles phase, where nothing mattered if it was not about John and Paul. Meanwhile, my 17 year old son likes to play multiplayer shooters while listening to Mozart’s Requiem. On other days he makes methodical passes through the entire Depeche Mode back catalog. Besides Game Of Thrones, his bedtime reading consists of chronicles of some of the most obscure periods in Persian, Egyptian and Chinese history few have heard of. Time means nothing to my kids, only quality does. For my children, Mozart, Stevie Nicks, David Gahan, Ezra Koenig and Lorde all exist simultaneously in a vast random-access buffet. 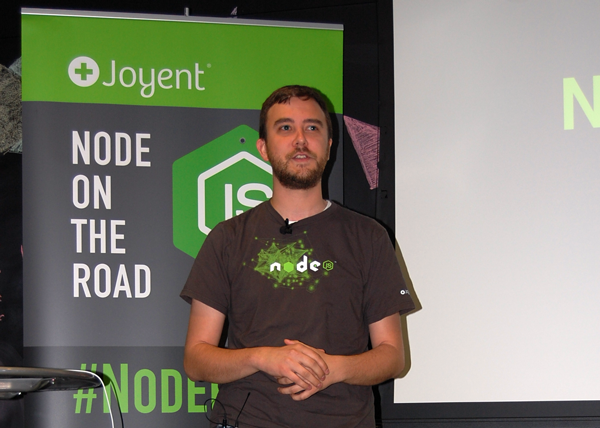 Interesting #node.js articles on this blog: dejanglozic.com/tag/node-js/ by @dglozic . Not all new stuff, but kind of enterprizey view on Node. Are there multiple ways of looking at Node.js? 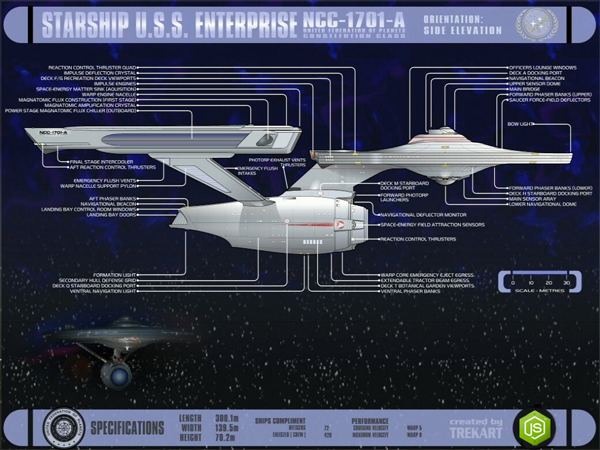 Is there a ‘startup-y’ way of looking at it, and an ‘enterprise-y’ way? Is the former more cool, is the latter the more boring, adult, ‘taking all the fun out of it’ way? More importantly, should enterprises only use older, proven technology, while startups and individuals play with the new and shiny? It is no secret that I work for IBM, the biggest and oldest of all the IT enterprises out there (it is 103 years old!). Should I even be allowed to write about, play with, and (God forbid) push for Node.js in IBM, let alone make it the center piece of the new micro-service architecture for JazzHub? Let’s see how my kids would approach it: because they are young and unaware of stereotypes, they would totally use Node.js for the front end, because they have little patience for tedium and Node.js would allow them to iterate through the interface ideas much faster. If they had some high performance/CPU task to accomplish, they would not hesitate to write it in Java, or even better, C or C++. Or maybe they would look at Go. They would add i18n support so that they can show what they built to their relatives in the old country that are not very good in English. They would add security because some bored hackers would pounce on their site as soon as it became live (my daughter’s Club Penguin account was repeatedly hacked when she was 9). They would do all these things because they are common sense, they are important, they matter and you cannot be ‘done’ until you have them. The moment you have customers and feel responsibility for them, you are doing ‘enterprise-y’ stuff. NPM just became a company (they raised 2.6m in seed funding less then two months ago), and you know what one of the first orders of business were? Ordering external security audit. That sounds very ‘enterprise’ to me. Uber business model may sound weird to you* but they are a serious business (serious enough to create a pushback from lobbyists in each new market they expand to), and they were running Node.js in their dispatching system since 2011. The same for AirBNB, although they jumped into Node in 2013. I am using these two companies as an example because they are relatively new and don’t fit the stereotype of a classic ‘enterprise’. And yet, look at their web sites carefully – both sport a dropdown to choose the language. I can paraphrase a classic joke ‘you know you are a redneck…’ as ‘you know you write enterprise-class software when you need to deal with i18n’. Of course, If you are an enterprise that wants to sell to the US government, it’s not a stretch goal – you must meet regulation 508 to even be in the running. There is an equivalent set of requirements for the European Commission. But you don’t have to be beaten with a government stick to add i18n and accessibility to your business’ web application – it just makes sense because you can reach more people that way. And it is not limited to Node.js – go through the examples of the wildly popular Bootstrap toolkit and search for the word ‘aria’ – you will see 43 hits because all the components have wai-aria accessibility support. 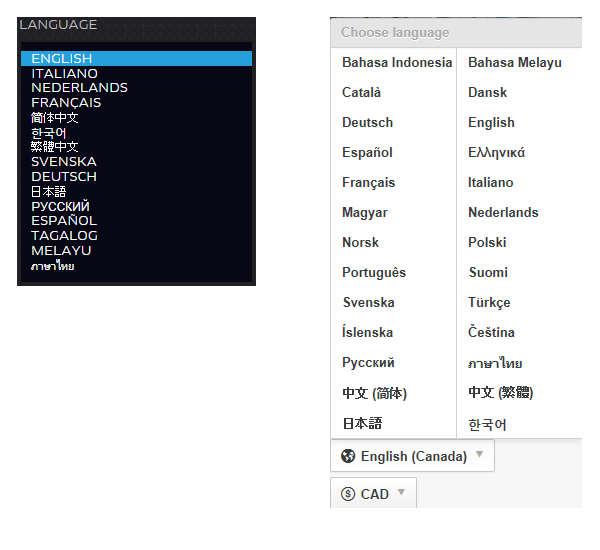 Uber (left) and Airbnb (right) language picker. 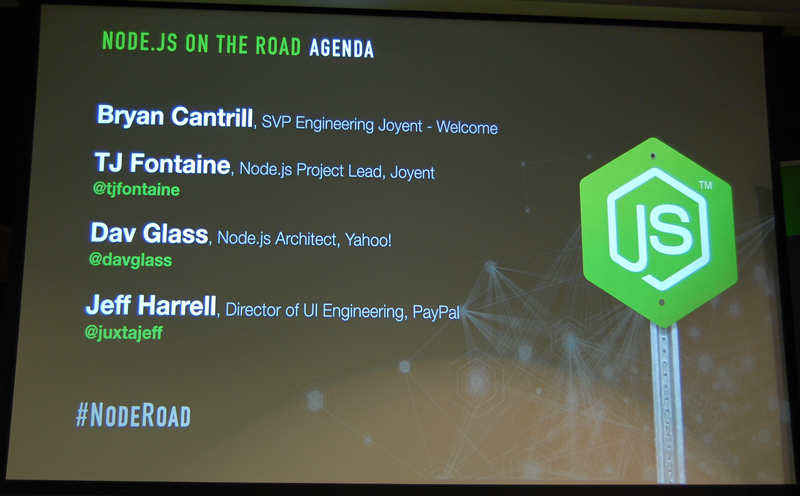 We are now entering the most exciting phase of Node.js’ young life – Node.js in the enterprise. The signs are everywhere, from testimonials of companies reinventing their systems using Node.js during Node Summit 2013 and NodeDay 2014, to the surge in articles and discussion on enterprise micro-service architecture (Martin Fowler creating a Downton Abbey event by releasing the article on micro-services in mini-episodes, only to be challenged to a post-off with an alternative article – man, this is going to be fun!). Sometimes, a historic perspective helps, so here is one. In 1995, Sun made Java and JVM public as an alternative to C++ for desktop applications. It was interpreted, it was slow, it was buggy but it was new, exciting, promised ‘write once, run anywhere’ without recompilation, and the community was growing rapidly. In 1996, I was asked to try to write a prototype of a framework that would allow an IBM middleware development tool with a significant GUI to run on AIX, OS/2 and Windows NT without maintaining three separate code bases. I wrote it in Java and called it JFace. This framework eventually ended up in a much larger body of code (albeit totally rewritten) in what was later known as the Eclipse Platform. A three-pane JFace window showing three alternative representations of the same model, circa 1998. The point of this story is that I was asked to solve a problem using Java when Java was only 2 years old, and the huge Eclipse platform effort was based on Java when it was 4 years old. At that time, Java was buggier and slower than Node.js is today (performance inflation-adjusted). In fact, Java was consistently slower than the incumbents, whereas Node.js shows performance improvements when used as designed (for systems with a significant I/O activity). I am sure people had their doubts about Java in its time, but that didn’t stop them from forging ahead and fixing whatever had to be fixed to dispel those doubts. In a sense, some people in the enterprise sound like parents who had a wild youth, then forgot all about it and turned into old fuddy-duddies. As you see from my example above, we were fearless before, we can be fearless again. In five years, something new will come along, and we will have this discussion again. So to wrap up, it is very unlikely that any Node.js discussion today will not be ‘enterprise-y’ – we have great HWPS (Hello World Per Second) numbers and now need to solve real problems that involve i18n, security, scale, independent evolution of micro-services by large teams, inter-service messaging, clustering, continuous integration and deployment with zero downtime etc. Let’s approach it the way my kids approach music – open minded, without prejudice, without preconceived notions, on merits only. Node.js is but a tool in the tool box, use it as intended and it will repay handsomely. Feeling reinvigorated, loving your job again, being excited to get your hands dirty and code is tossed into the package for free as a reword for your open mind. *Correction – the original article had an erroneous claim that Uber cars have silly pink moustaches on their grills. In fact, they belong to their competition Lyft. Thanks to @bdickason for spotting the error. The post title unintentionally sounds like a movie franchise (e.g. Star Trek II: The Wrath of Khan), but in my defense I DID promise I will return to the topic of pushing events to the browser using Socket.io and Node.js in the post about message queues. The idea was to take the example I wrote about in Pushy Node.js and modify it so that the server messages are received from another service using a message queue. Alas, nothing can be hidden under the Google administration – a quick search yields an article from 2010 on mullet architecture (an actual one, with houses, not software). There is even such a thing as ‘reverse mullet’ – party in the front and business in the back. Frank Lloyd Wright aside, I did mean ‘software architecture’ in this particular post. I wanted to mimic the situation we face these days, where Node.js front end typically communicates with the legacy services in the back that nobody dares to touch. 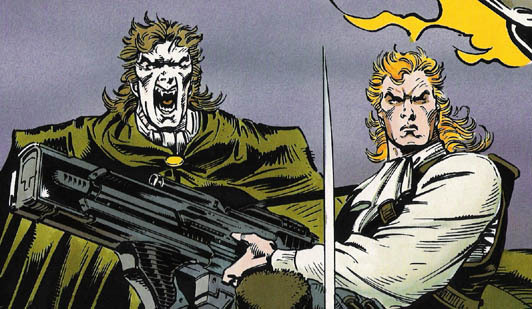 As a result, this post will mix Node.js, Socket.io, MQTT protocol and Java app (posing as the mullet’s backside). I am all for accuracy in advertising. 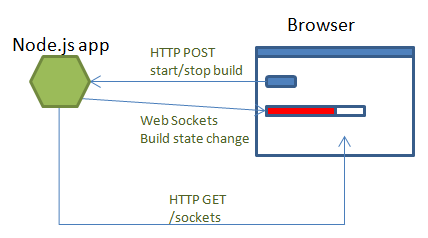 To refresh your memory, the example app in the previous article was creating a hypothetical system in which builds are running on the server, and as they are going through their execution, we use Web Sockets to drive the Bootstrap progress bar in the browser. To make the original sample palatable, we faked the build by simply using the timeouts. We will continue with the fakery, but remove one layer by moving the fake build into a dedicated Java app. This Java app (if you squint, you can imagine it is in fact a Jenkins server running builds) will react to the POST request to start or stop the build, but the build service will publish messages using the message broker. Our Node.js app will subscribe to the ‘builds’ topic and pass the information about the build progress to the client using Socket.io. This all provides the ‘how’, but not the ‘why’. Recall that the power of message queues is in avoiding polling (our Node.js app does not need to constantly nag the Java app “are we there yet?”), and also in providing for flexible architecture. Imagine, for example, that in the future we want to capture trend data on build average times and success/failure rates. We could easily write another service that will subscribe to the ‘builds’ topic and store the data in a DB, and also provide a nice data visualization. I can easily see a nice Node.js app storing data into a NoSQL database like as MongoDB or CouchDB, and a nice page rendered using Dust.js template and D3.js for data visualization. Why, the app is practically writing itself! The key point here is that you can easily add this feature tomorrow by simply adding another subscriber to the ‘builds’ message topic – you don’t need to modify any of the existing apps. This low friction way of growing the system by adding micro-services is very powerful, and has also been reinforced during the recent NodeDay in the presentation by Richard Roger, founder of NearForm. All right then, we know why and we know how, so let’s get busy. First, we will install RabbitMQ as our message broker. I have chosen RabbitMQ because it is open source, supports multiple protocols, scales well and is available as a service in PaaSes such as CloudFoundry or Heroku. As for the protocol, I will use MQTT, a lightweight pub/sub protocol particularly popular for anything M2M. 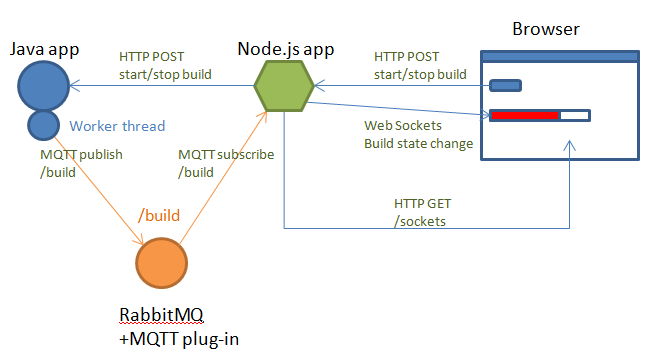 If you want to play with MQTT but don’t want to install RabbitMQ, a lightweight open source MQTT broker called Mosquitto is also available, although I don’t know how well it can hold up in production. For our Java app, both AMQP and MQTT clients are readily available. 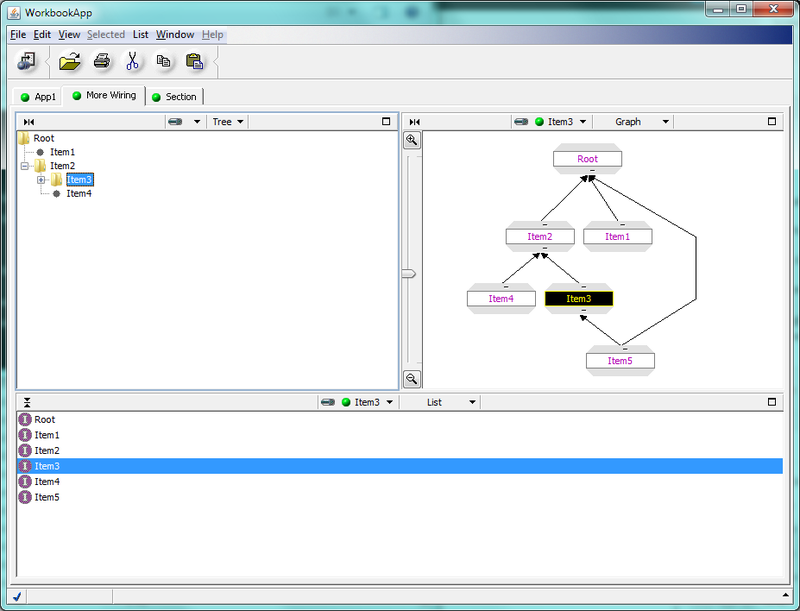 RabbitMQ provides the AMQP client, while Eclipse project Paho has the MQTT client. For this example, I will use the latter. 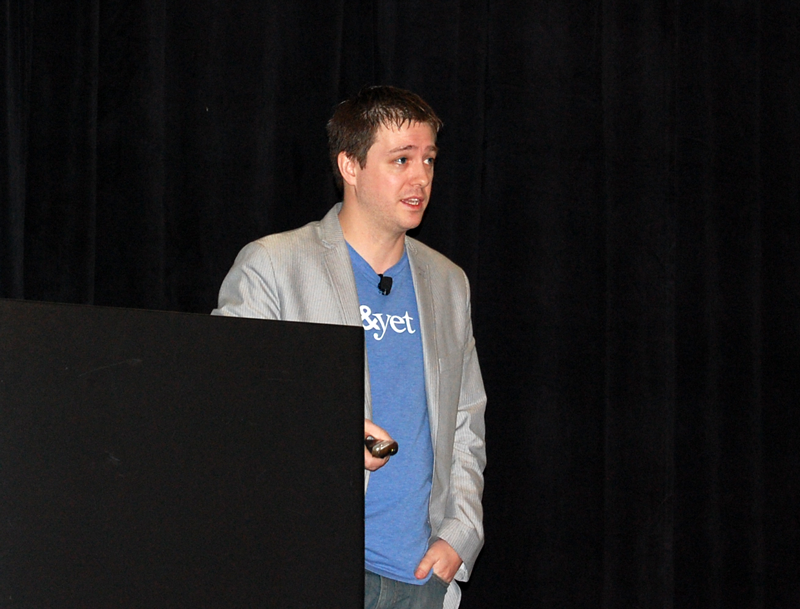 When you have time, read the article REST is for sleeping, MQTT is for mobile by J Spee. 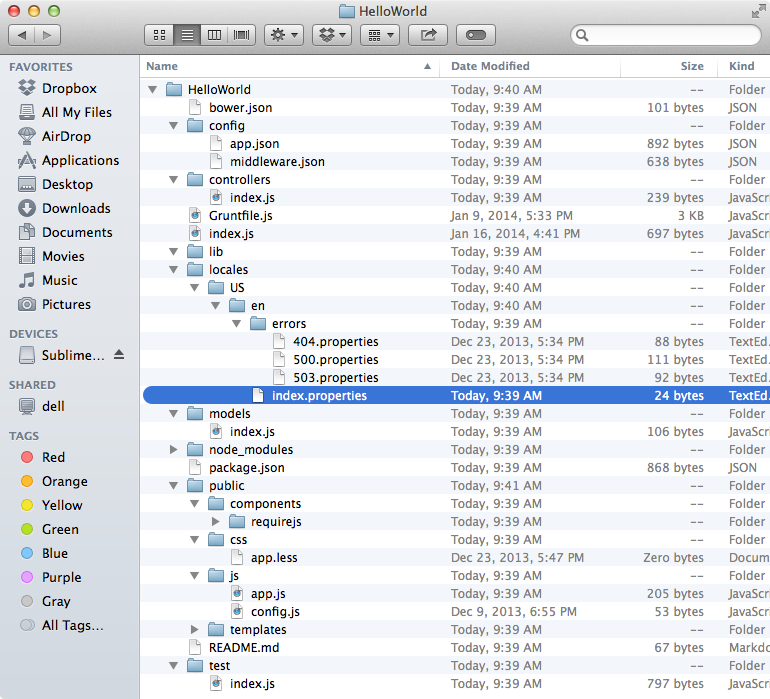 A Node.js app handles the initial GET request from the browser by rendering the page with a button and a progress bar. Button click issues a jQuery Ajax POST request to the app, initiating a fake build. As the build is going through the paces, it uses Socket.io and Web Sockets to push the progress to the brower, moving the progress bar. The flow starts as in the original example, but the Node.js app just proxies the build start/stop command to the Java app listening on a different port. The Java app will kick a fake build on a worker thread. As the build is running, it will periodically publish messages of its progress to the message broker on a predetermined topic using MQTT client. Node.js app registered as a subscriber to the same topic will receive the messages and pass them on the browser using Web Sockets. In terms of behavior, this code in action looks the same in the browser as the previous example, but we made an important step towards an architecture that will work well in todays’ mixed language architectures and have room for future growth. What I particularly like about it is that Java and Node.js apps can pass the messages in an implementation-agnostic way, using JSON. Note that the Java app in this example is not as far-fetched as it may seem: you can make the example even more real by using a Jenkins service. Jenkins has REST API that our Node app can call to start and stop build jobs, and once a job is underway, we can install an MQTT notifier plug-in to let us know about the status. The plug-in is simple and uses the same Paho client I used here, so if you don’t like what it does, it is trivial to roll your own. This post is the continuation of my trip report that started with part 1 on Node.js on the Road. 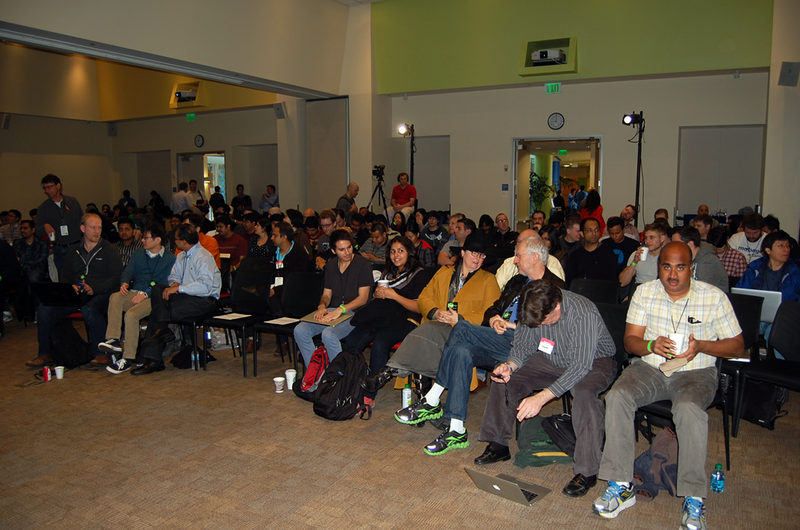 NodeDay was organized and hosted by PayPal in their building in San Jose, CA, on Feb 28th 2014. 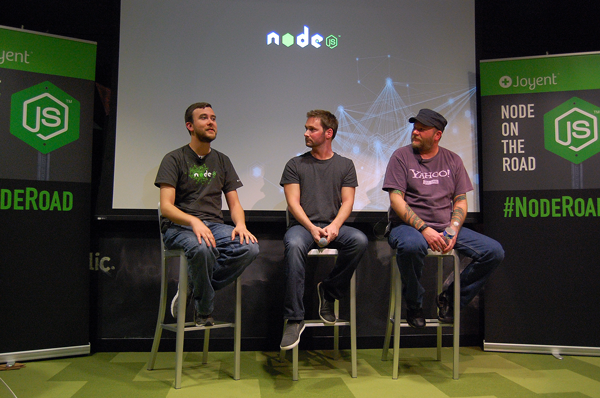 The focus of the one-day conference was Node.js in the enterprise, which was a great fit for what we are now doing with Node.js in IBM Rational. Add in the opportunity to talk with Bill Scott, Richard Ragan and Jeff Harrell about their use of Dust.js in production, and it all added up to a promising day. 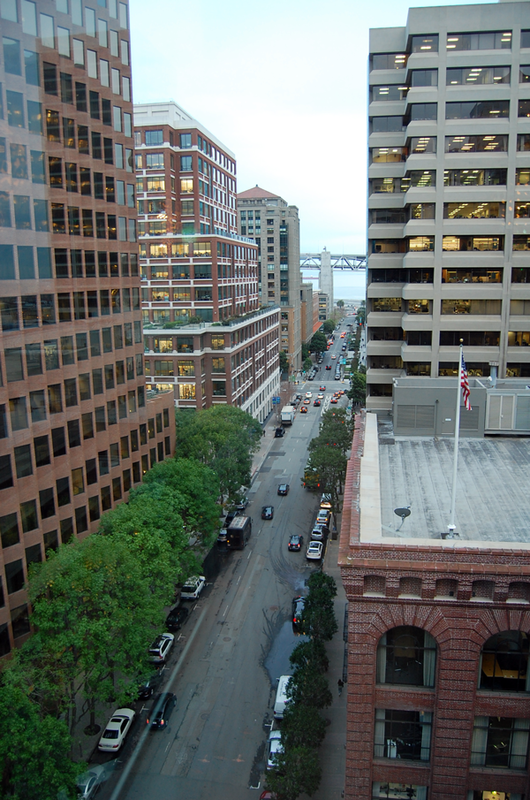 I drove down 101 South from San Francisco to my hotel in San Jose in a calm evening. Last thing I remember before I fell asleep was muted howling of unusually strong wind outside my hotel window. Then I woke up into a morning of storm reports, flash floods, mud slides and falling rocks throughout the region. I must have been very tired. Luckily, this was largely over by the time I finished breakfast, and PayPal was only 2 miles away. We got badges and bracelets at the entrance. 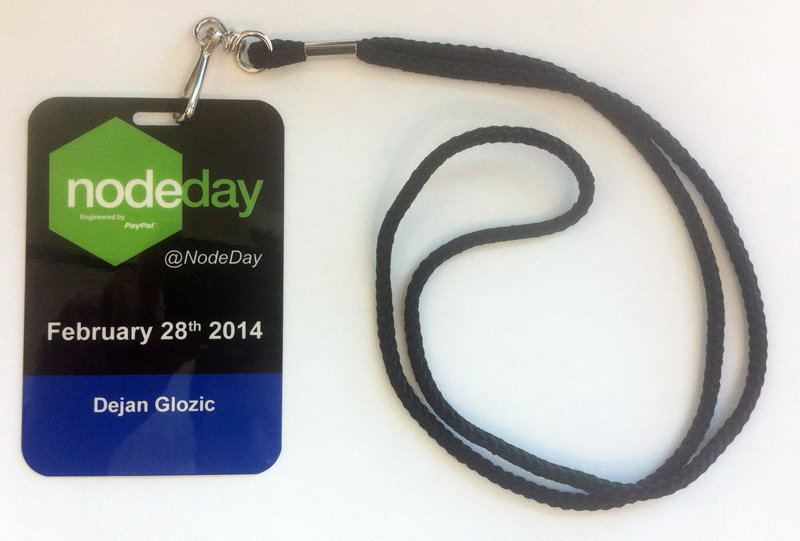 Badges doubled as agenda – simple and minimalistic, as you would expect from a Node.js event. 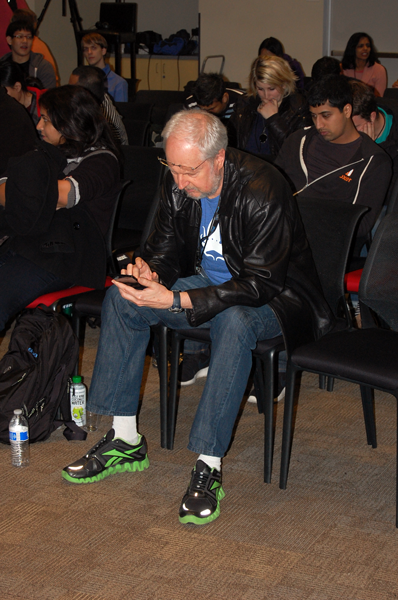 The event was kicked off by Bill Scott, Senior Director of UI Engineering, PayPal and our host for the day. 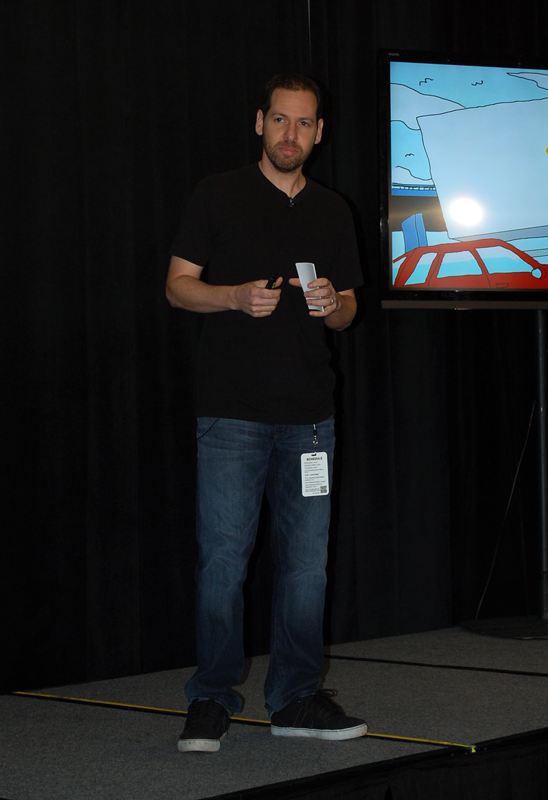 The first keynote was by Eran Hammer, Senior Architect of Walmart Labs, who was singlehandedly responsible for pushing me off the fence and into Node.js development. 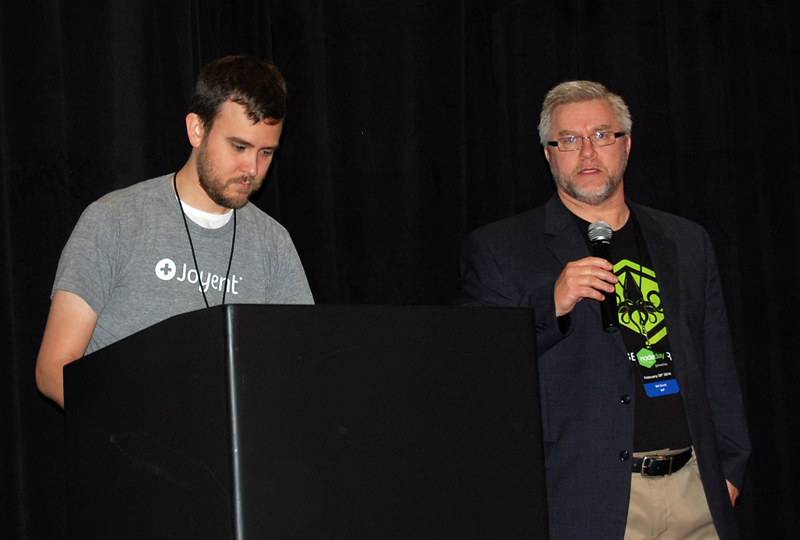 The watershed event was Black Friday 2013, when 55% of Walmart traffic was from mobile devices, and handled by Node.js servers. The uneventful day for the pager-carrying developers cemented their trust that Node.js has ‘arrived’, resulting in Walmart doubling down on Node and spreading it to the rest of the enterprise. 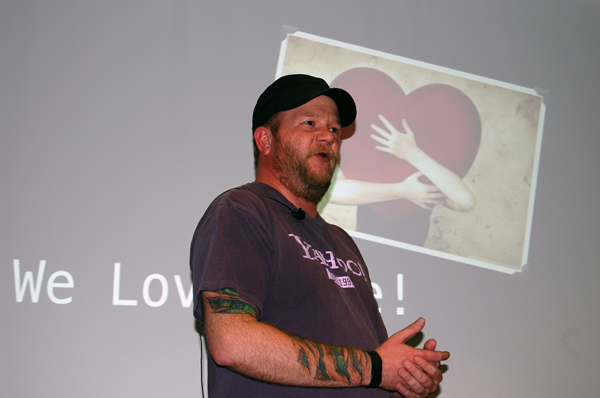 Eran’s focus was on saving the typical enterprise Java developer from living a double life – passionately using Node at home, and wrestling with the legacy projects behind the firewall at work (illustrated with a contrast between unicorns and rainbows at the top of the post, and the Intranet wall of dead puppies – see the rest of the presentation). A common myth is that Open Source is all done by little guys, individuals and startups – just technology and no politics. In reality, Open Source is sustained and flourishing in the enterprise – nobody is using the Open Source more than the enterprise (and Walmart is not exactly a startup either). Why? Because people see the leverage that working for large companies can give them. Hence, we need more ‘Inc.’ in our Node, the community to be one, instead of Enterprise people being on the side. We (the enterprise) should not feel like we are on the fringes. For example, Joyent has been the best supporter of the project, and one of the biggest consumers of Node. The business of paying for support for Open Source projects is still alive and a valid one. With NPM in the news recently, it is clear that profitability is not a dirty word, it is the only way to sustain the community. Issues such as private NPM repositories that are so important for enterprises were initially hard to take seriously, but it is obvious it is understood now, judging by half a dozen solutions already available. It shows that in many cases, building on what is already available and perhaps sponsoring/adopting core contributors is a cost-effective way to get things done and ensure critical support. 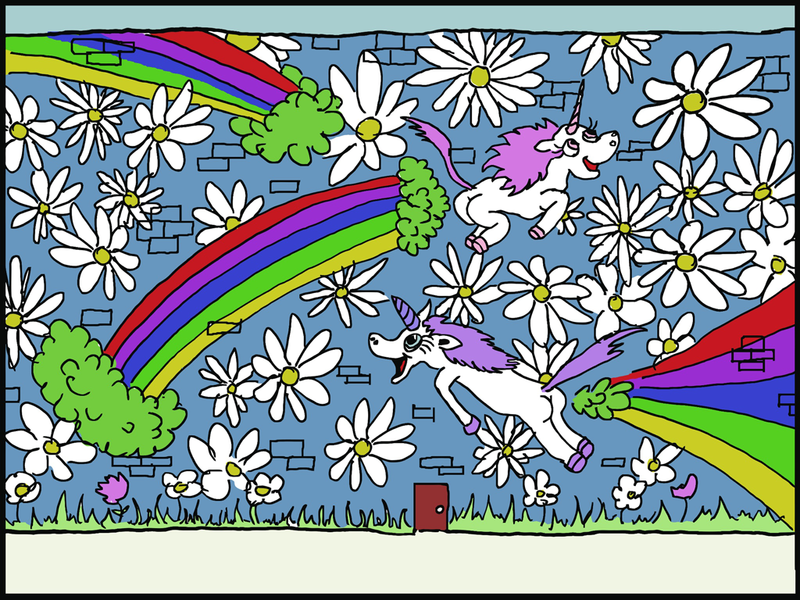 Doing everything in-house is an anti-pattern. 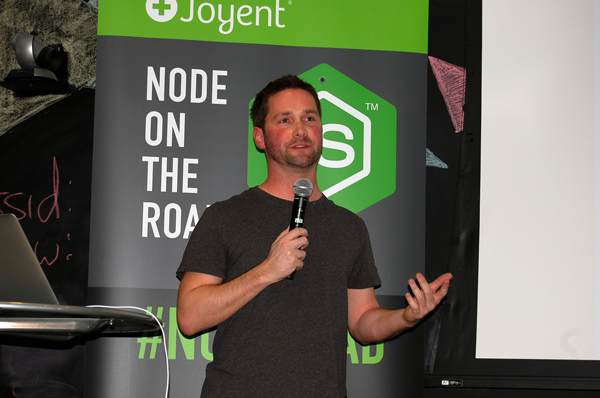 TJ Fountaine, Node.js Project Lead from Joyent has mostly repeated his talk from ‘Node.js on the Road’, which was a good thing to do since there was no overlap in the crowd between the two events (not counting myself of course :-). You can read my report in the previous post with no loss of data. 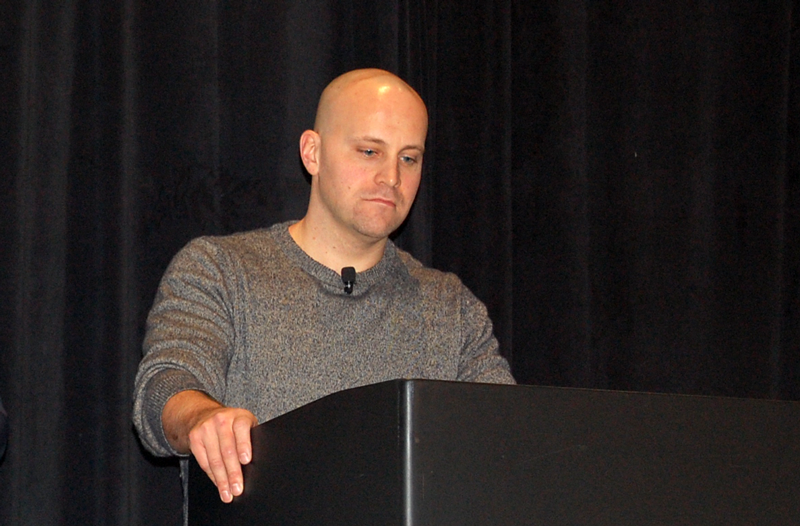 Adam Baldwin, Chief Security Officer – &yet, has covered a touchy subject – Node.js security. With all the enthusiasm for the new way of working Node provides, enterprise is very touchy around security and it is a big topic when considering Node adoption. Adam suggests protecting what makes your money, and consider availability as an aspect of security (if the app is down, who cares if it is secure). The process of how you handle the vulnerability is the key (but you will screw it up anyway). When it comes to security, nodejs-sec mailing list is important because all security-related announcements go there (very few so far, knock on wood). In reality, most of the issues will be in Node modules, not the core – security is built into core, it is not a bolt-on module. The enterprise is responsible for what you require() – there has to be a process in place for vetting modules, and private NPM repositories. Linting is recommended (using npm install precommit-hook). Security-related test cases are important (some orgs only write test cases for the happy path). One useful library that can help – retire.js (scans your web app or Node app for use of vulnerable JS libraries). With all said and done, the greatest vulnerability in the enterprise? Joe McCann, COO of The Node Firm has addressed the business case for Node. There are many signs of Node.js maturity – exponential growth in NPM, number of books published, enterprises going into production with Node. 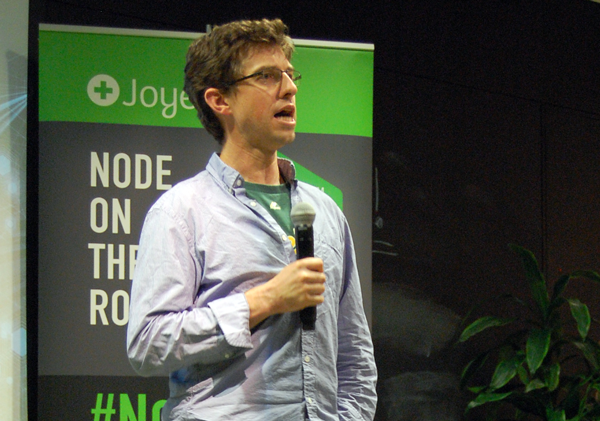 He posited that a mission statement for Node should read: “An easy way to build fast and scalable applications”. As to ‘Why Now’, he suggested that legacy stacks are impending innovation and make companies less competitive. Groupon moved from a monolithic application that became a burden and a blocker to a service-oriented architecture. Node.js now handles the same amount of traffic using less hardware (direct cost savings – a music to every CFO’s ears). At the same time, page load times decreased by 50%. The use of a common layout service allowed them to retain the ability to make site-wide design changes quickly. Walmart achieved Black Friday CPU utilization hovering around 1% (you want to be bored when on pager duty). In addition, quality of candidates after switching to Node.js increased – Node is a magnet for talent. This is important – Node could be a differentiator in hiring/retaining. In Yahoo!, Node.js services are handling 2M requests/minute, 200 developers write Node, there are 500 internal and 800 external Node modules. Node brought speed and ease of development. Back to business tenets, innovation is helped by building things faster and more efficiently. Productivity is helped by terse syntax and absence of thick layers of bureaucracy that slow developers down. “Productive developer is a happy developer”, which helps with developer joy and helps stability and retention. As for hiring/retaining talent, there is a magnetism of working on Node that is unique. Finally, cost savings are real and palpable: fewer developers writing apps in less amount of time, using less hardware. Using Node in multiple projects multiplies the savings. The reality of enterprise architecture is that mixed stacks (Node.js + Java/PHP) are everywhere. Right now, front end in Node.js is a safe bet, but there is growth in systems around Node. At the request to cover some failures (to counter success stories for fairness), Sam from Amazon.com offered a counter-argument of why some shops cannot get there just yet – some libraries just do not exist yet (but time can help plug this gap). In the same vein, LinkedIn is still a huge Scala/Java shop, and in some use cases Play framework is easier to move their developers forward than to make a massive switch to Node (LinkedIn still uses Node for their mobile services, and they are very fast). The takeaway is that while Node.js is obviously at an inflection point and it is not hard to find success stories, but it will never be a magic bullet that will solve all the problems. It is imperative to ensure that the problem to be solved is a good fit for Node. After lunch and an opportunity to socialize with actual people in the 3D world and full HD (what a concept! 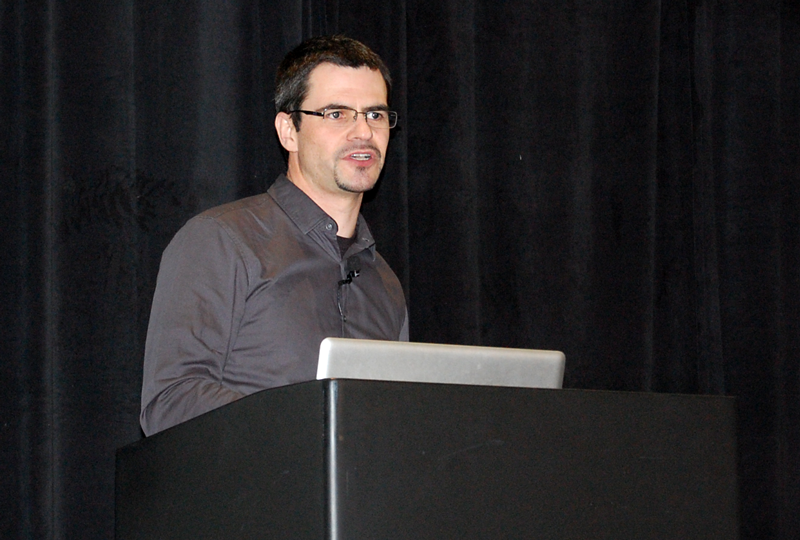 ), Erik Toth, Principal Software Engineer at PayPal took us through the fuzzy and complicated world of moving a large developer workforce to NodeJS. He provided a set of hard won tips on how to handle resistance and problems along the road. First off, accepting that your rationale might be non-technical is healthy – Node is as much a way of life as a technology. There will be critics, they will parrot questions, represent opinions they’ve read as their own, use outdated information, micro benchamrks, assume you have ulterior motives, they will underestimate you (real engineers use something else). They will assume that because they haven’t heard of something, it doesn’t exist, and all of this without even looking at the technology. The secret to overcome this? Influencers. You need to have an advocate that absolutely believes in it, and things will start happening. Setting limits is key – focus and avoid some things, avoid inventing problems to have something to solve, solving other peoples’ problems, or solving solved problems. Only fix what is broken. 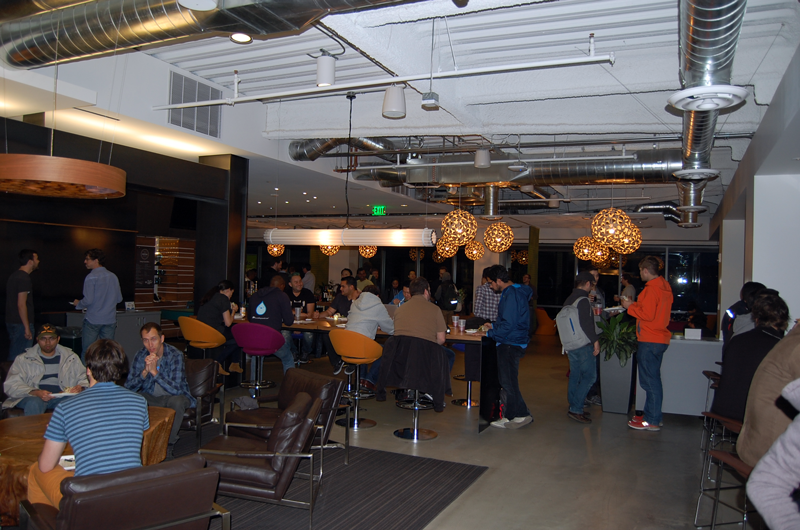 For PayPal, it was primarily velocity and productivity, so there was a need to scale people, product and technology. This requires an ecosystem: GitHub, npm, tooling. 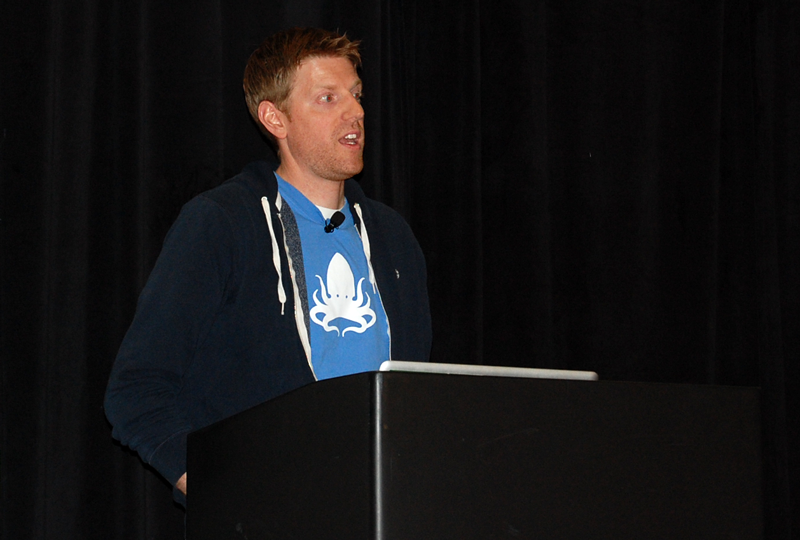 Erik pointed at silos as a serious impediment (enterprises like Game of Thrones). They breed distrust, create shallow alliances based on selfish goals, black-boxes teams and code. He suggested elimination of backlog as a concept (where features go to die). A key takeaway for individual developers? Individuals rarely solve real problems – benefit from the work of others. This is not revolutionary, just harder in the enterprise. Finally, the quality of code should not depend on the access rights (“The only thing that should differentiate public and private modules is access rights”). Be proud of your code, expect copypasta, learn semver and teach others. Oh, and the key takeaway from the Q/A: “We treated Node as something that will go away in 5 years, and we didn’t want to impose custom solutions to those that will come after us”. 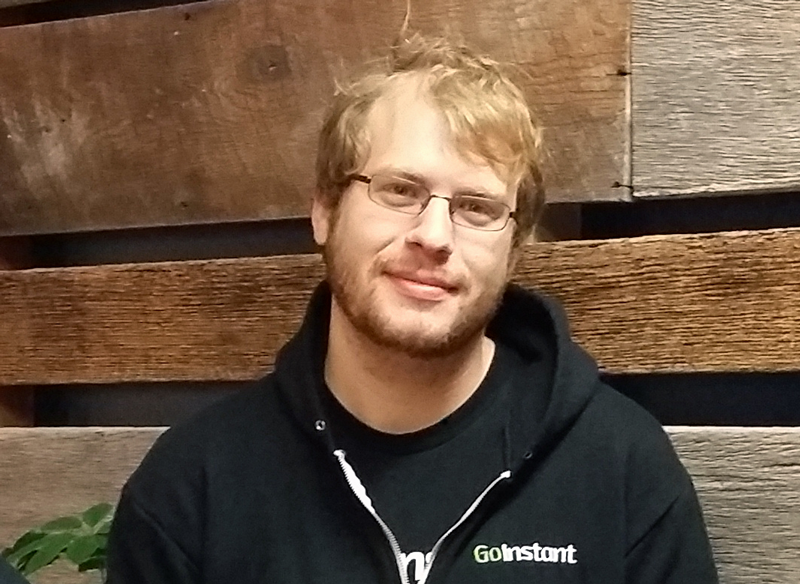 Ian Livingstone, VP of Engineering of GoInstant told a war story of using Node in two apps, and how the second time was informed by all the mistakes made in the first app. The first app was written in the time when Node was instable. More importantly, growing code base is a maintenance nightmare, which greatly underscores the important of writing small modules instead of large monolithic apps (a common theme throughout the NodeDay). Ian offered many tips collected the hard way. For example, state must live in a class instance, not in modules. Furthermore, when a class has a state, it must have both ‘initialize’ and ‘destruct’ methods. Another trick that helped was the use of JSON schema, which makes it easy to exhaustively test code. This includes schema for Request and Response (run only in development, limited in production for performance reasons). On the topic of UI testing, Ian pointed out that multi-user integration tests are required to excersize user interfaces. Selenium was an obvious first choice, but the tests ended up verbose and very fragile, and took a long time to run. NPM to the rescue: a tool called ‘Barista’ (extension to Mocha) proved to be a better solution. Lesson: the power at your finger tips through the Node eco-system is incredible. The need to avoid one giant code base cannot be stressed enough: like in Java’s “God object”, leaked responsibilities between modules made the code base into a giant ‘house of cards’ that was fragile and very hard to test, greatly diminishing trust in the code. Solution: small, simple and independent modules. The second time around, applying all these hard-won lessons had a hugely positive effect – it changed the conversation. A small downside – longer install times via NPM (solved by using a proxy backed by S3). Node works better when it has one thing to do, favoring an architecture with many small and simple services. As a convenience, each service has a client library that wraps the transport concerns, making it easy to consume and test. Using upstart and supervisord provided for process lifecycle management. Takaway – Node.js is power, and many problems have already been solved by the community. Trevor Norris, NodeJS Core Maintainer from Mozilla took us on a journey much closer to the metal, under the layers of abstractions we are so used to in our daily work. The aim of the presentation was not to prove that all abstractions are bad, just to make their cost clear. He offered a number of performance tips related to intimate knowledge of V8 engine that powers Node (example: inlined functions can’t contain more than 600 characters, including comments; inlined functions must be declared close to the call site etc.). This level of detail is not very practical to everyday Node developers writing modules at higher level of the stack, but are a reality for Node Core developers that must worry about the performance envelope of the bedrock on which everything else resides. In that spirit, Trevor continued to provide advise on the most obvious ‘sins of our abstractions’ – the fact that some events like DNS and FS are in fact pseudo-async (they tie up a thread in the background), and again sternly warned about using the new execSync function that is a very odd animal in the ansync world of Node. Key takeways: write code that you can maintain, write code that doesn’t crash – the slowest code is the code that doesn’t run. And finally, code for your case. Very few developers actually code with Node Core performance requirements in mind. Richard Rodger, Founder of Near Form really drove the point of keeping Node processes small (a motif of the entire conference). This ensures that services are easy to restart, which makes for a fault-tolerant system. With a number of services running in the system, a communication mechanism is require (messages). Processes need to be small (100 lines of code), a few screens to scroll, that can fit inside your head. Frameworks are discouraged – use modules and composition. A good message broker that supports pub/sub is very handy in this architecture – it makes the system loosely coupled and extendable. 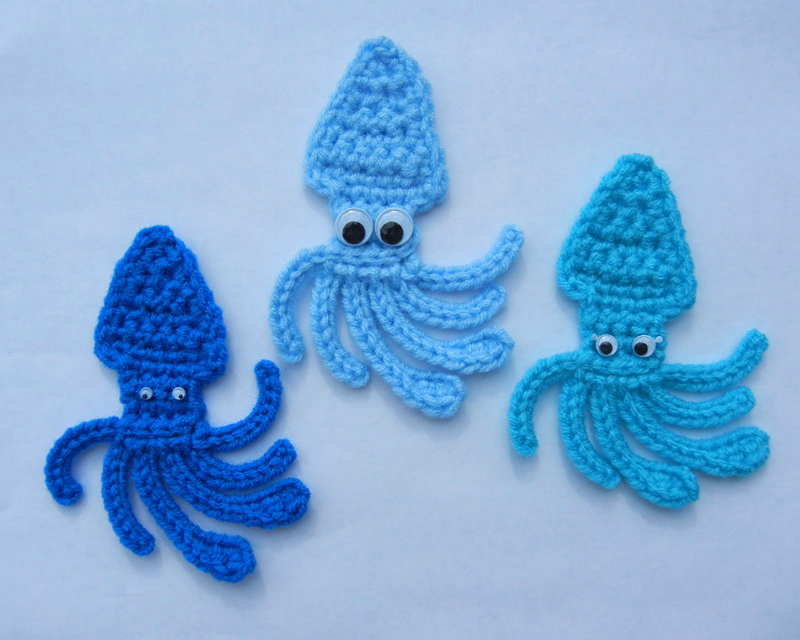 Micro-services also make rewrites cheap, avoiding project management ceremony. They localize bad coding choices, making them less of an issue because they are confined to a single micro-service. Not all services are created equal – some are critical and require a lot of attention, some do not. By grouping services by quality, focus can be applied where it counts. As always, fixing a bug later in the cycle carries a higher cost, but with micro-services, the curve is less steep. 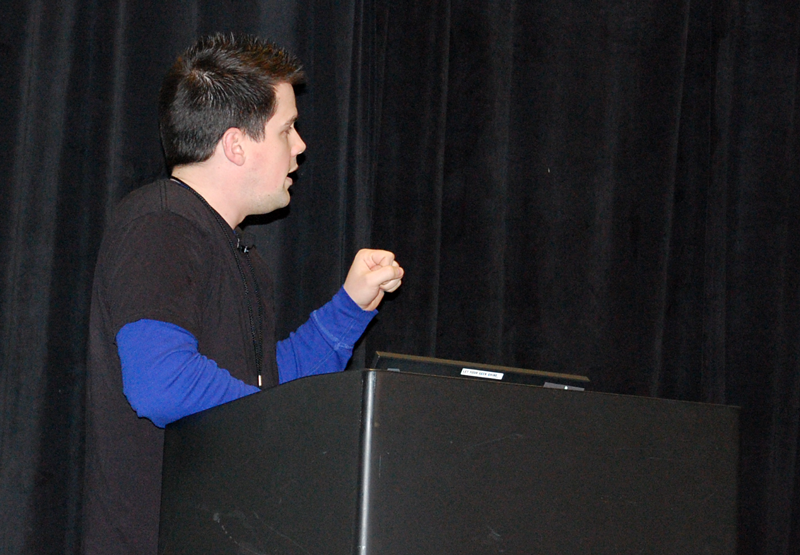 Richard provided some real-world examples of approaching a problem using micro-service architecture. The approach flows from user stories, to capabilities, services and messages. After that, decisions need to be made on how to run in production: what performance, scale, behavior and message transport are needed. Of course, production rollout need not be extensive – a good start can be to run all the micro-services on one machine and cluster only the ones that actually need it. As a final comment, Richard agreed that micro-services can be built in any language – Node.js is simply a very suitable option, but not the only one. All in all, it was a well organized event and an amazing opportunity to talk to a number of key people in the Node.js community all in the same day. In effect, it was like its topic – I was able to talk to more people and learn more in a shorter period of time and virtually no downtime – like a true Node app. Kudos to Bill Scott for being a gracious host and Lenny Markus for ensuring it all went without a hitch.